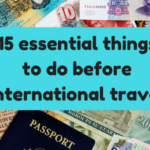 I vary what items I bring with me depending on how long I am traveling and if I am traveling internationally or just a road tripping a few hours from home. However there are a few must have travel products and gadgets that I bring everywhere I go – in addition to my smartphone and toiletries of course! 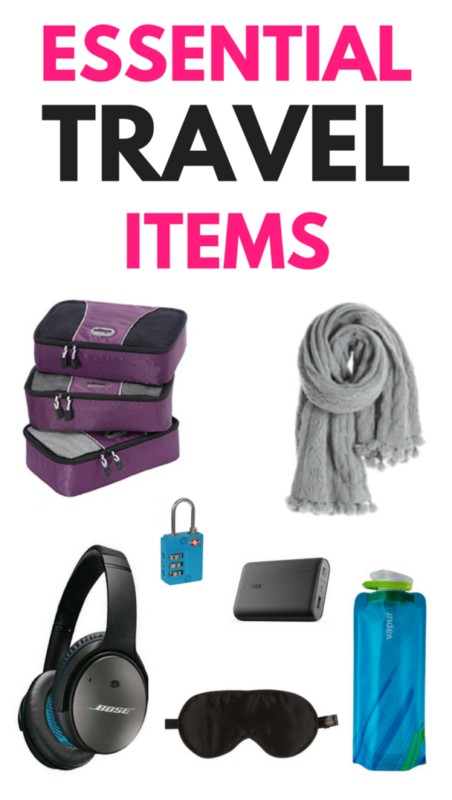 Here are my picks for the essential travel items that I never travel without. If I had to pick the one must have travel gadget it would be an external battery. I always carry at least one external battery to charge my phone and other electronics when I am not close to a power outlet. My smartphone runs out of battery so quickly that I cannot live without one! A solar portable charger is a more environmentally friendly alternative. I am somewhat of a germaphobe so I always bring antibacterial wipes or hand sanitizer with me when I travel. These wipes are my favorite because they are individually wrapped so I can throw some in my bag or pocket. They are perfect for cleaning dirty surfaces on airplanes (tray table, arm rests, seat belt buckle) and hotels rooms (TV remote) and are also handy when I find myself somewhere with no where to wash my hands. I drink a lot of water and I like for it to be cold so I never travel without my reusable water bottle. Filling up my bottle saves me from having to buy tons of bottled water -not only does it save me money but it is environmentally friendly. Noise cancelling headphones or earplugs are useful products for travelers in all kinds of situations – blocking out noise from crying babies in airplanes, loud hotel neighbors or street noise. These are the best headphones I have found. A traveler can never have too many locks. I have several of these TSA approved locks probably because I lose them! I use them to lock my bags in when checking bags on flights and even lock up my carry on luggage in case I am forced to gate check it. I also lock up my luggage when I am away from my room at my hostel or hotel. Every traveler could use an eye mask. An eye mask will ensure you get a good night sleep on flights, rooms without black out curtains or hostels with roommates that keep the lights on. I never go anywhere without a scarf even in the summer. A lightweight scarf keeps me warm on cold airplanes, chilly summer nights, and places with freezing air-conditioning. You can also use your scarf to cover your face if you don’t have an eye mask or to cover your shoulders when visiting churches or temples. I always bring a few energy or granola bars just in case I get hungry and can’t stop for food. This cute RFID Blocking travel passport wallet is perfect for organizing my carry-on travel essentials, including my passport, boarding pass, credit cards, id and cash. The RFID blocking shield material which protects from identity theft is a plus. Packing cubes are necessary travel items for keeping my belongings organized in my luggage. I love posts like this – useful ones, especially because I always forget something with me! So, I think it’s time to make a list, and your tips will definitely help me in it. Thanks for sharing them! So you have mentioned all of them that even I would love to tag along with me, I would love to add power bank, oh man, isn’t that too essential? Your recommendations are really good and useful. A little extra-tip: You can get all these things really cheap everywhere in Asia and in Latin America, too, so no need to schlep them with you; and the quality is just as good – most of the time the stuff we get in Europe or in the US is manufactured there, anyway. 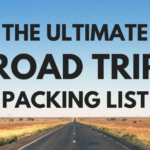 An excellent list, you don’t need everything and the list is great reminder for me at least to ensure I have the bare essentials and peace of mind to travel without worry.